Successfully Added Uhans Max 2 Android Phone - Android 7.0, Octa-Core CPU, 4GB RAM, 6.44-Inch Display, 1080p, 4300mAh, 13MP Dual-Cam (Gold) to your Shopping Cart. The Uhans Max 2 is a powerful Android phone that comes with an absolutely breathtaking 6.44-Inch IPS display. On this screen, the Android smartphone treats you to crisp Full-HD visuals in 1080p resolutions. Thanks to this, you’ll be able to enjoy all your media like never before. Whether you’re at home, in the park, or in the bus – with this Android phone you’ll always undergo a cinematic experience. With 64GB memory and a 128GB SD card slot, it treats you to plenty of storage to keep all your films, games, and Apps. With this Android phone at your side, you’ll always be able to carry along your favorite media anywhere you go. 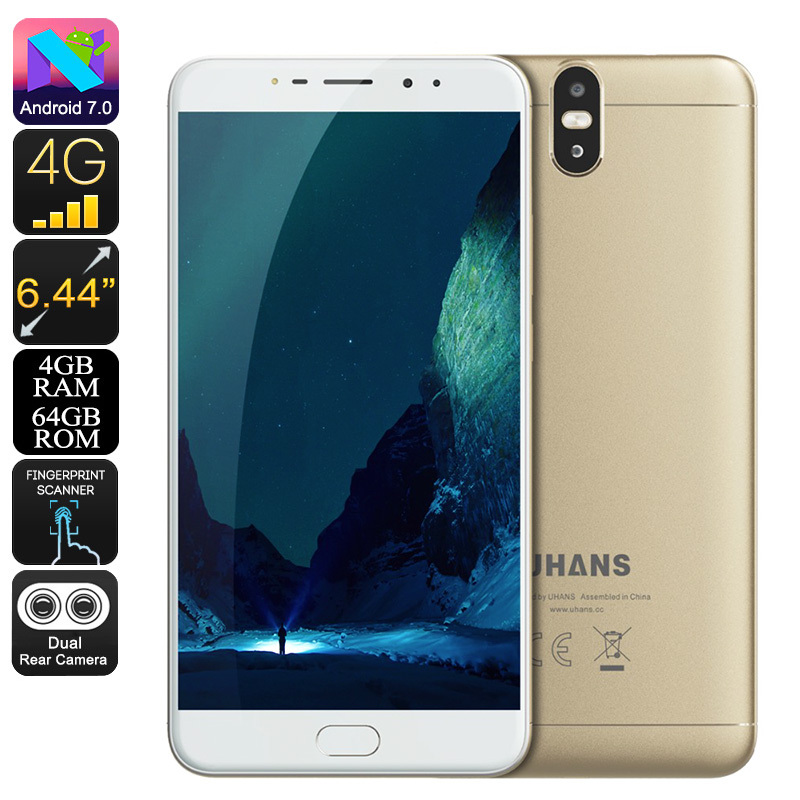 With its Dual-IMEI numbers, the Uhans Max 2 Android phone allows you to slide in two SIM cards and lets you stay connected to both at the same time. This means that you can always be reached at two different phone numbers while you’re only using one device. If you’re a busy business person or often travel abroad, this feature will be particularly handy for you. Along with its 4G support, this Android phone makes sure that you’ll always stay connected no matter where you’re at. The phone packs a whopping 4300mAh battery for 12 hours of usage time so you won’t have to worry about running out of juice while you’re heading out for the day. Packed within its body, this latest Android phone holds an Octa-Core processor that has been clocked at 1.5GHz. Along with its powerful CPU comes 4GB of RAM that meets all your multitasking needs. With this hardware at your disposal, you’ll be able to enjoy the latest software features without ever slowing down your phone. In combination with the phone’s Android 7.0 OS, you are guaranteed to undergo an outstanding user experience at any moment. The phone furthermore comes with a stunning 13MP Dual-Lens camera that is sure to meet all your photography needs.